← When will it snow in Columbus? Tinley Park, in Cook County, Ill., is the August hotspot that law enforcement professionals will want to respond to. 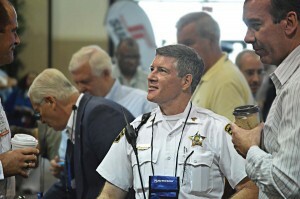 The city hosts the 113th annual Midwest Security and Police Conference Aug. 19–20 at Tinley Park Convention Center. Thousands of officers, chiefs, trainers and detectives will take advantage of the opportunity to not only see what technology is headed toward their departments, but to also learn what techniques have been perfected and hear the news that’s likely to affect the job description in the coming year. Represented at the two-day conference marketplace exposition will be the Big Three auto companies, public sector software providers, manufacturers of tactical equipment and more. Also at the expo exhibitors should look for The Municipal Account Executive Chris Smith, who will be taping shout-outs to law enforcement agencies and departments everywhere. A reception that takes place at 6:30 p.m. on the first day will benefit Illinois Special Olympics. For reservations or any information on the conference — including registration — visit www.mspce.com.